As we age, excess skin and sagginess can develop in the upper eyelids. The extra skin can drape over the upper part of the eyes with the resulting hooding making us look tired, stressed, and considerably older than we really are. Upper eyelid surgery (blepharoplasty) at our Evans and Augusta, Georgia plastic surgery practice serving Aiken, South Carolina can eliminate puffiness and hooding of the skin in the upper eyelids to open and brighten your eyes. In addition to rejuvenating your face and giving you a more youthful appearance, upper eyelid surgery may also improve vision impaired by excess skin. 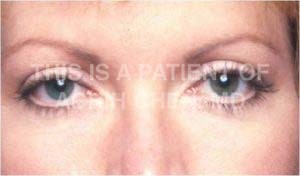 Upper Eyelid Surgery Evans and Augusta, Georgia: The eyes have been said to be the “window to the soul.” Certainly, they are the focus of visual contact. When greeting each other, we tend to look each other in the eyes. Often our eyelids are the first area to show signs of aging, which can take the form of hooding or excess skin in the upper lids. This can result in a tired or un-rested appearance. In some individuals, excess skin of the upper eyelids can be present at as early as the 30’s. 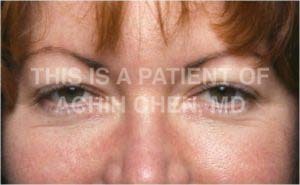 **This is a patient of Dr. Achih H. Chen who has given consent to use these photos. Although this is related to the aging process, it is also related to our inherited eyelid anatomy. Upper eyelid surgery in Evans and Augusta, Georgia and for patients in the Aiken, South Carolina area can greatly improve your excess upper eyelid skin, opening up your eyes and brightening your appearance. Please contact Dr. Achih H. Chen for more information or to schedule a consultation at the Georgia Center. The upper eyelid hooding caused by excess skin and fat is treated through an incision that Dr. Chen hides within a natural crease called the supratarsal crease. 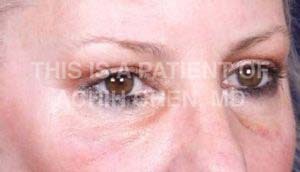 A crescent moon-shaped area of the excess upper eyelid skin is removed and a conservative amount of fat is removed. 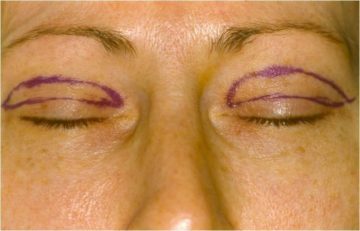 In some individuals, the hooding of the upper eyelids is made worse by also having low brows. With aging, the brows will lower, causing the upper eyelids to be more even more hooded and heavier in appearance. In these individuals, an upper eyelid surgery (blepharoplasty) alone will not completely address the hooding. For patients considering upper eyelid surgery (blepharoplasty) at our Augusta and Evans, Georgia / Aiken, South Carolina-area practice, an even more complete aesthetic makeover can be produced by combining the procedure with other options, including JUVÉDERM™ facial rejuvenation, facial implants, lower eyelid surgery, or facelift surgery. 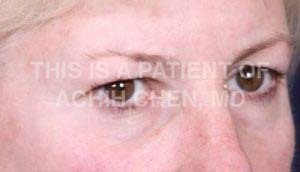 Dr. Achih H. Chen can significantly improve the appearance of the area around the eyes and make you look more youthful and vibrant with blepharoplasty in Evans and Augusta, Georgia (eyelid surgery). Serving Augusta and Evans, Georgia; Aiken, South Carolina; and beyond, the staff at the Georgia Center encourages you to contact our cosmetic surgery practice with any questions you have. For quality aesthetic enhancement options from an experienced facial plastic surgeon, look no further than the Georgia Center!